This is a full transcription of Misc. DON 830 (Acc90/64), being the military journal of Lieutenant George Bourne, which is held by Lincolnshire Archive Office who have graciously given me permission to publish. For those interested, a second journal does exist dated 1819 to 1837, but I have chosen not to publish this portion as it relates purely to farming matters and therefore unlikely to interest military historians! My aim as always in this series of booklets is to increase dramatically the number of personal memoirs and accounts available to future historians and thus hopefully filling in gaps in our knowledge and building towards that perfect understanding of the lives and actions of these soldiers in the Napoleonic Wars. 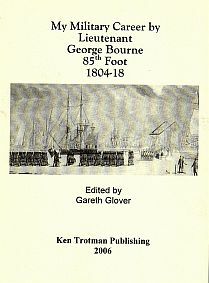 George Bourne started his military career in the North Lincoln Militia and his descriptions of life as a Militia officer on service in England are of great interest, particularly as almost no records of this particular Militia regiment seem to still exist. George came from a farming background and his journal is scattered with numerous allusions to his passions of shooting, hunting and horse racing, activities which clearly continued to fill his time during these years of quiet garrison duty. However, following a short spell in Ireland with the 7th Garrison Regiment, George joined the 85th Foot and undertook Light Infantry training, under Brigadier General Baron Rottenburg, when they were converted to this role at Brabourne Lees in 1809. George soon found himself fully involved in the Grand Expedition Walcheren, where the 85th had a major role to play in the early military operations, before it stalled. His records include a unique set of the orders for the landing and the flags to be used. On his return from this debacle, George took a wife and gained a recruiting post which allowed him to remain in Britain when the regiment went to Spain. He was however, fully involved in bolstering of its numbers when the regiment returned from Spain again, badly depleted. George had clearly tired of the military life and eventually sold his commission, to purchase a property for his family and returned to his first love, farming. George Bourne eventually died at Hatton Holgate, Spilsby on 4 April 1865 aged 84. The Journal was clearly not written up regularly, but seems to have been brought up to date every so often during the period and is therefore largely clear of the dreaded ‘hindsight’. His honest style and slightly unusual stance on many things make this a very interesting read particularly for those interested in ‘home’ service during the Napoleonic wars and the Walcheren campaign.